Securing a third-country passport to access European investors is no longer viewed as the “go-to solution” it once was by the UK investment fund sector, according to Tim Hames, the director general of the British Private Equity & Venture Capital Association. Hames was speaking as a panelist at the Guernsey Funds Masterclass, held in London last week on the impact of Brexit on fundraising. Under the Alternative Investment Fund Managers Directive (AIFMD), investment managers based in the UK are entitled to a passport with which to access European investors. Without it, they would rely on the pre-existing national private placement regimes (NPPRs), which many jurisdictions are considering phasing out and replacing with the passport, despite NPPR offering a more efficient route to market for many investment managers. “I think it’s worth emphasising the point that even before the referendum had occurred, industry sentiment had become more ambiguous as to what it really wanted,” said Hames, pictured left, speaking at last week’s event. Fellow panellist, Phil Bartram, Partner at Travers Smith, agreed that the reality of Brexit had called into question what the best way to market to European investors would be going forward. Bartram, who said that a “third-country passport was not a panacea for the UK industry as we go into Brexit”, described his experience in relation to non-EU funds utilising NPPR as “largely positive”. He referenced Apax Partners, Cinven, BC Partners and CVC as non-EU funds that had raised significant sums recently or were in the process of doing so. “These are mega funds and they’re doing it perfectly happily,” added Bartram. 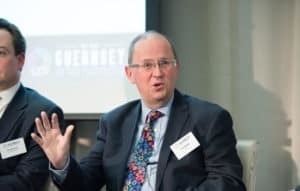 Last week’s event, which attracted an audience of more than 200, was hosted by Guernsey Finance in conjunction with the Guernsey Investment Fund Association, also, as reported, threw up some interesting revelations about any post-Brexit trade deal is likely to be seen as ‘cherry-picking’ and unacceptable to the European Union’s remaining member states. Following on from address to more than 200 financial services practitioners, International Investment spoke to Guernsey Finance chief executive Dominic Wheatley, who revealed some of the challenges that the Crown Dependency was facing following the Brexit vote, in a special video interview. 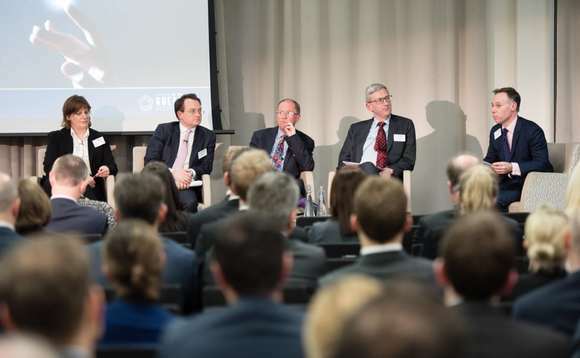 Pictured at the event: Moderator, Christopher Anderson of Carey Olsen (seated far right), leads the panel session at the Guernsey Funds Masterclass. Joined by fellow panellists (L-R) Emma Bailey, Guernsey Financial Services Commission; Phil Bartram, Travers Smith; Tim Hames, the BVCA and Steven Lowry, Basalt Infrastructure Partners.